This picture was captured somewhere close to Negombo. A few kilomtres from the main airport of Sri Lanka. Meanwhile, an epic Trail, which was started on the 1st of July has now completed two thirds of its journey. It is a walk right across Sri Lanka to collect US$ 2million to build a Paediatric Cancer Ward in Jaffna Hospital. I hope the walk is successful in raising the money to build the new ward in the hospital. What a great cause. Glad you all have finished 2/3rds of the journey... That is awesome. Yep it is a splendid intiative by the organizers. Wonderful shot. Walking all alone for long stretch. Thanks for your comments Rajesh! Hi KP, what a fantastic piece of work. 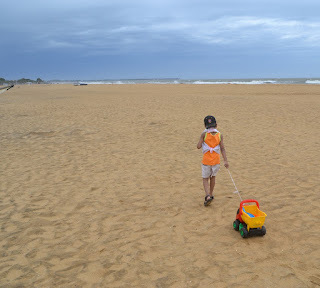 I walked on a deserted beach almost like this in the south of SL, I am sure with thoughts not much different from this kid's. Before I knew it, I had walked about 6KM just drinking in the nature.Then the rains came forcing me to turn back. Love the way you bring out your ideas, be it on monutain tops or a beach. I just want to throw away my shoes and walk. Yes, I couldn't stop taking a picture of him. It was a windy day and a perfect evening to be at the beach. That's a wonderful project. I hope it will succeed. I would have love to join that walk for a cause project, should I be in Sri Lanka or somewhere near. God bless your soul for helping those in need. Looks like you get some mighty powerful waves! Glad you like the image. I just took a picture of this kid and later thought it is a good one to mention about the charity walk. I went and "liked" the FB page for the Trail, I hope they earn $2 million and then some! Nice photo with a great initiative!